Hello everyone! 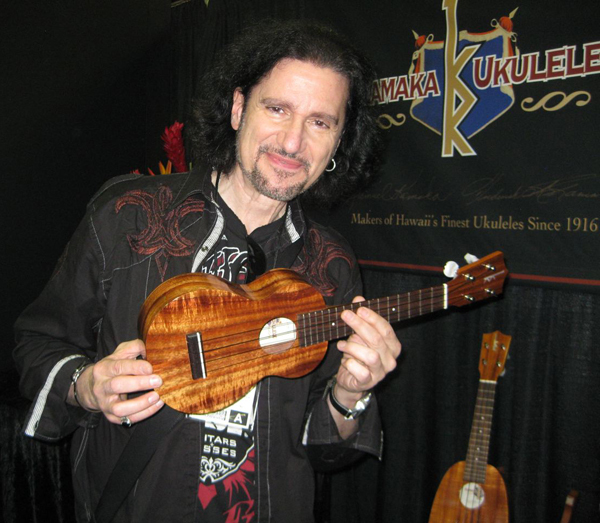 The big NAMM show, which USA Today said had 90,000 in attendance, was an amazing experience for me. I had the time this year to be there for three whole days, and I took advantage of that in a very big way. Besides thanking my endorsers and seeing all the wonderful attractive new equipment the manufacturers display so perfectly, I get once again a chance to see my fans, and to see my heroes. Thursday was the quieter day, and when I heard that Jack Bruce from Cream and his daughter Natasha would be at Warwick at 3PM I was first in line. I had the pleasure of actually jamming with Jack at a London Rock N Roll Fantasy camp back in May of 2007. I will never forget doing ”Sunshine Of Your Love” and White Room” with Simon Kirke from Bad Company on drums! Improvising with Jack was a dream come true as the band Cream was hugely influential in my early learning years. His daughter Natasha, who goes by the name ”Aruba Red,” is a fine artist in her own right, into groovy reggae stylings and performs in London frequently. 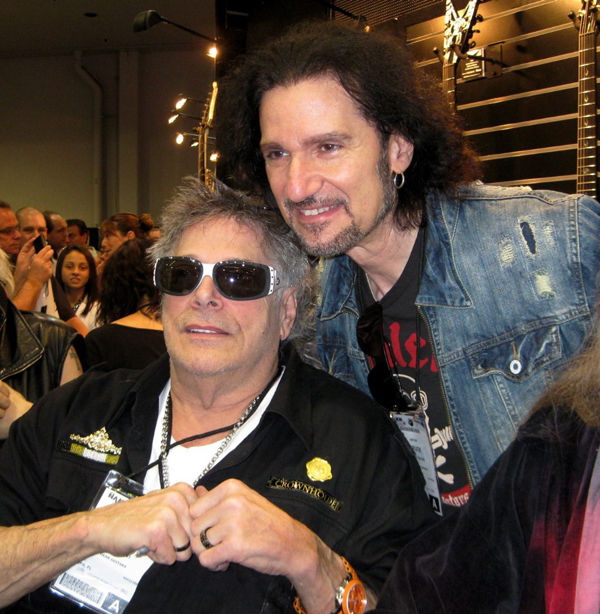 Jack was in good health and jovial for the NAMM event. 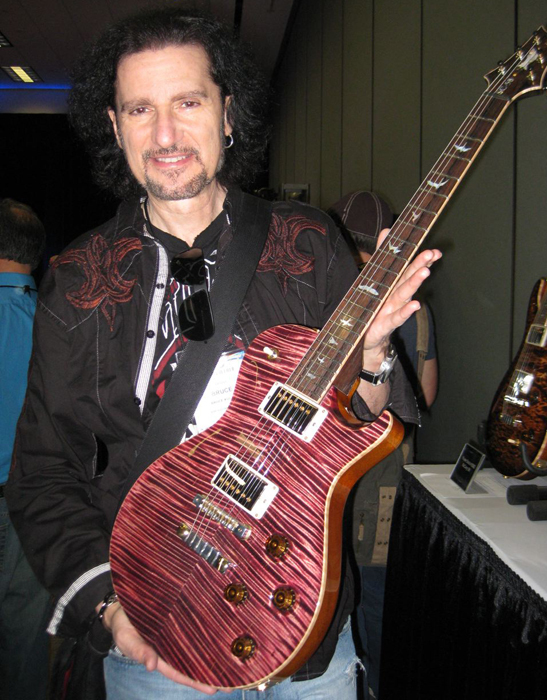 He received a lifetime achievement award at a big Hartke Amp company party on Friday night. A few days later I got the chance to sit in the private room at Warwick, Jack’s bass guitar company, and actually just talked about some gear, strings (he uses SIT Strings as well,) and things in London. He has quite a good sense of humor, quite sarcastic, and certainly not afraid to speak his mind. Natasha was sweet as always, and her thrill was meeting Boosty Collins! Check out how happy they all look. I found the Marshall booth after that, and some of my old friends came back to that company recently so there was much to catch up on. 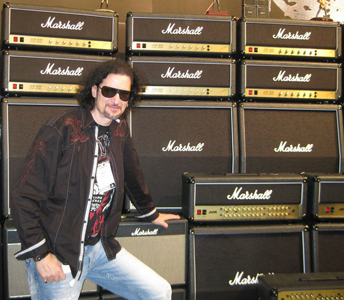 I told them what I think they should be doing and Yngwie Malmsteen came over to check out his new signature amp. He seemed quite pleased. The next day I did some video messages for Jim Marshall, and Paul Gilbert was there as well. 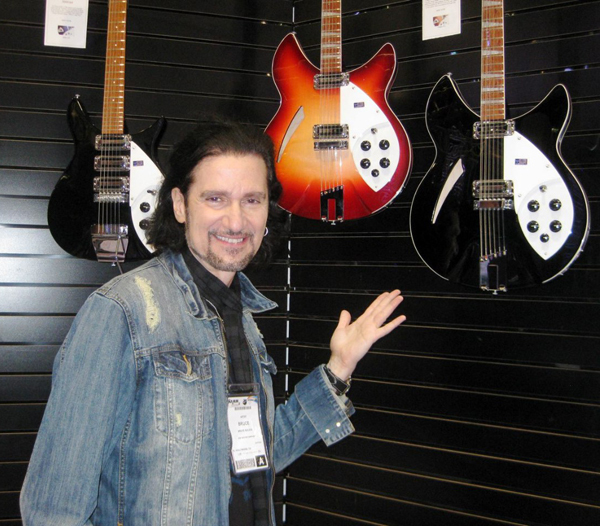 I also visited the Rickenbacker booth to see if there were any new Beatles guitars. 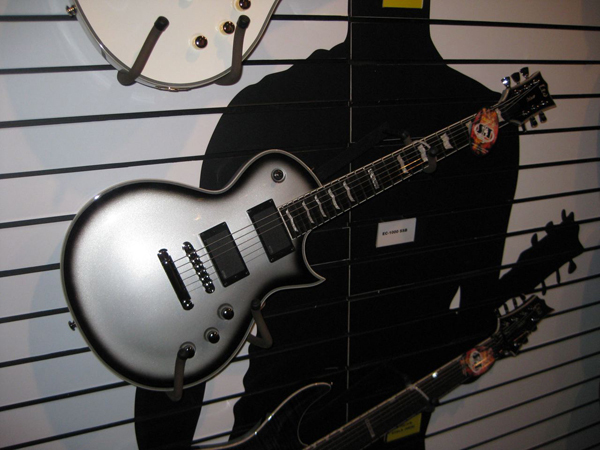 Then I headed over to ESP guitars to see my friends and have a chat with them regarding what is new. They had an awesome room with some very bitchin guitars. I have my eye on a few new finishes already of course! Most fun there is to see my old friend Makoto, who works at ESP in Japan. I haven’t been to Tokyo in a while, so we caught up and discussed BK3 coming out in Japan. He said he will get me a copy! 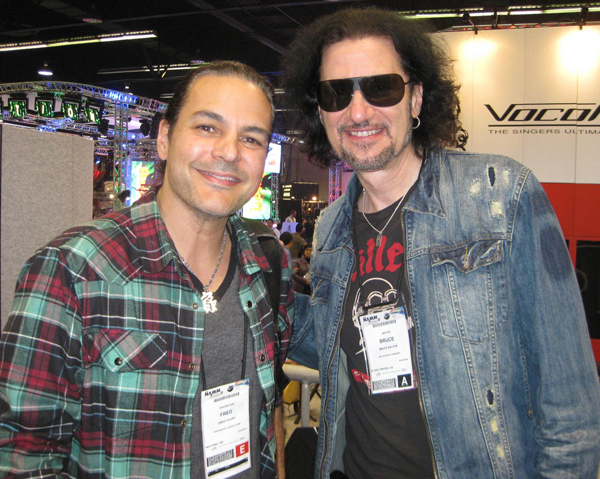 By the end of Thursday’s NAMM I had already run into or met many amazing artists. The most current hit artist Orianthi (Michael Jackson’s female hotshot guitarist), who is a proud PRS endorser, was at their booth and I introduced myself. She was very sweet and I got to see her perform on Friday night in the lobby at the Marriot Hotel. She can play that guitar great! And sing. Very proud of what she is accomplishing and I told her so. 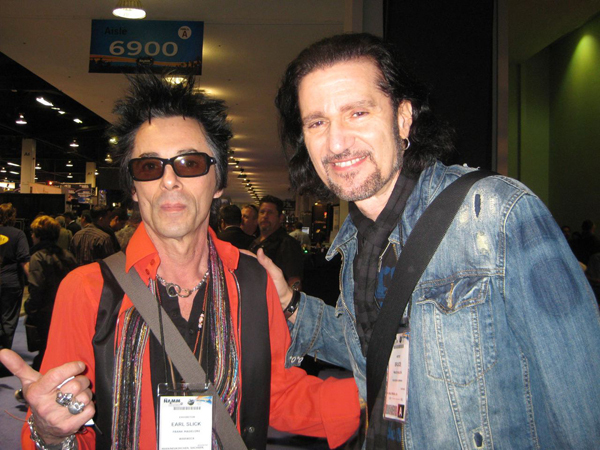 Earl Slick from David Bowie fame was there, and I met Uli Jon Roth from the Scorpions for the first time. I know a lot about him, and we had a nice chat. Howard Leese from Heart and Bad Company was there, and he invited me to the PRS party that evening. After NAMM was done for the day and I had a bite to eat I headed over to the PRS party room. Bon Jovi’s Bass player, Hugh McDonald, and his wife Kelly were there, and I met Brad Whitford from Aerosmith as well. Nice man, and his sons were with him hanging around playing the PRS guitars. 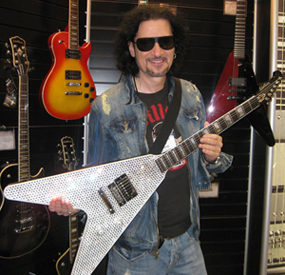 Derek St Holmes was there too, and I also ran into Dweezil Zappa as I was entering the room. 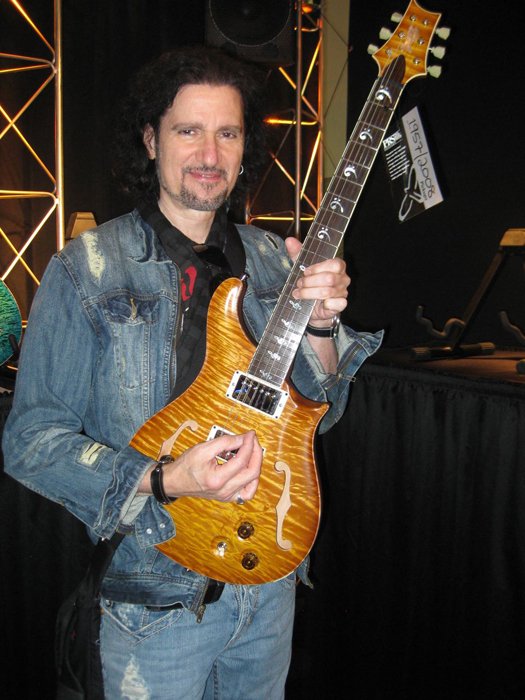 He has a new signature model with PRS that was unreal. Always a pleasure meeting the man himself, Mr Paul Reed Smith of course. He has accomplished so much in the past years. 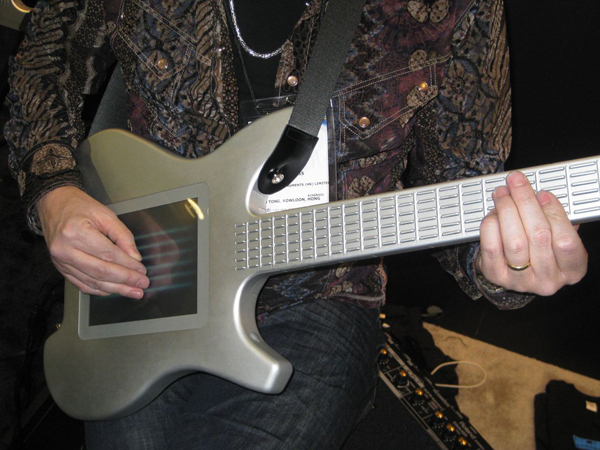 Friday was VERY busy on the NAMM floor. Once again I was running from Hall to Hall to look at everything I missed. I had a sheet with all the booths I hoped to see. This day many fans were greeting me, taking photos and saying they saw me on That Metal Show, etc. Some had copies of BK3 for me to sign! All were polite and fun to have a quick hello with. 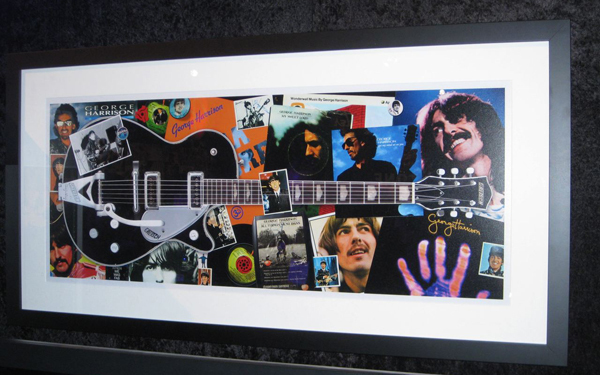 My goals were to see the Fender and Gibson booths, and I heard that there was a George Harrison model of an old Gretsch that he played that they reissued. 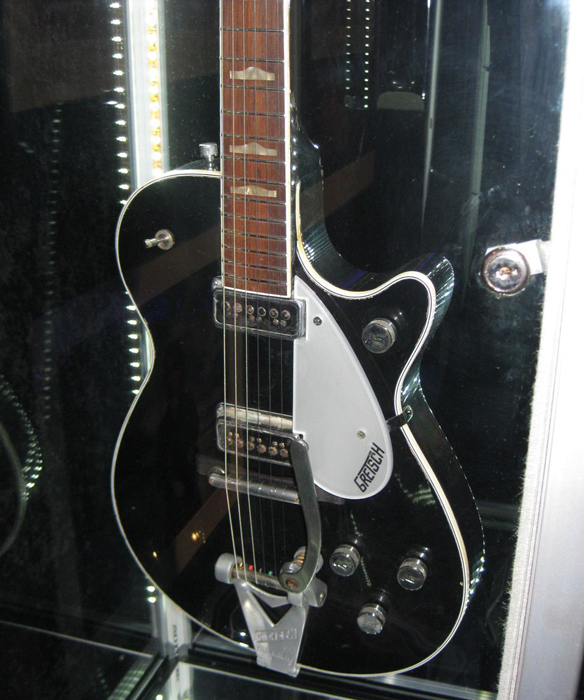 (Fender owns Gretsch). Wonderful displays there. I was impressed with some new Fender Road Worns, as well as the reissue of the Precision Bass. You all know I love to play bass, so I drool over them as well. I then headed over to the Gibson booth and thanked the factory manager from Memphis, David Winters, and ran into Don Felder from The Eagles. 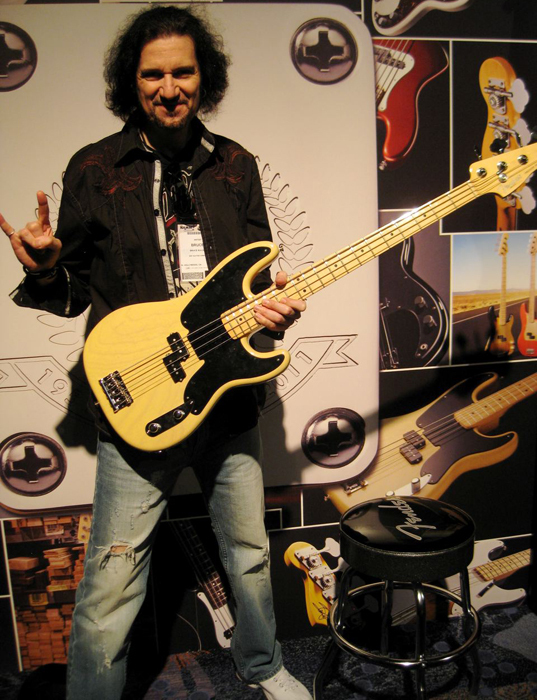 We have done some shows together with Grand Funk, and he has two signature models out now. The acoustics were insane at Gibson. This 50th Anniversary Hummingbird with gold inlayed appointments was crazy sweet. So much to see, and the place was getting really crowded, so I headed to the downstairs room that has smaller companies and many innovating products. I was crazy happy to see Koa Ukulele’s at Kamaka, and then saw the most space age crazy guitar synth thingamabob I have ever seen! No idea how successful that could be. Of course I had a signing at SIT at 3PM, so I headed over to thank them and see the fans. 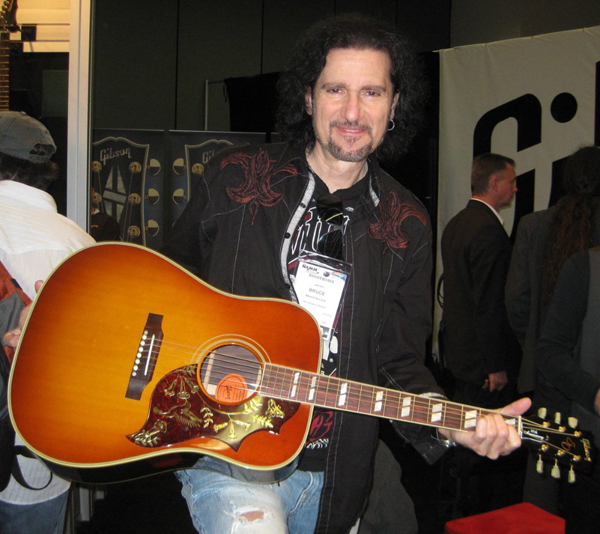 That 5000 Hall room has SO many guitar related booths… it was crazy! I finally got to the drum room. Not exactly my cup of tea, but I have some friends in that room and I said hello. Ran into Brent Fitz, of course, and Ricky Rocket who has his own drum company now. All too soon Friday NAMM was done. But then there was the evening events! Friday night after seeing Orianthi live at the Marriot I ran into the Night Ranger boys. Always a pleasure to see them. They played at Taylor earlier in the day, but I could not get in. Mobbed. Had a good chat with Kelly. I hope GFR does some more shows with them this year. Saturday was my final day, and I wanted to make sure I made it to any of the booths I missed. 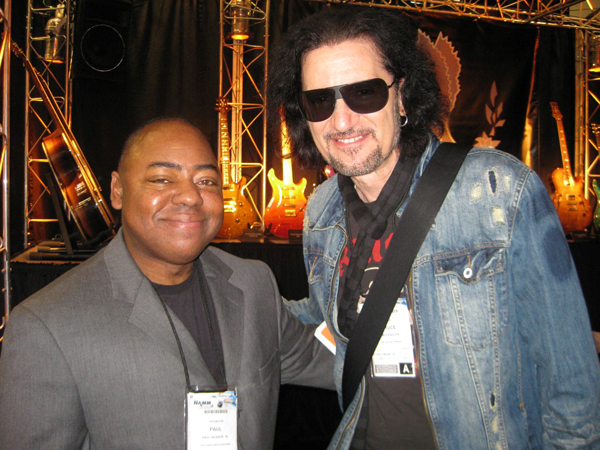 After meeting some friends at the PRS booth, I met Jay Leno’s guitarist Paul Jackson. 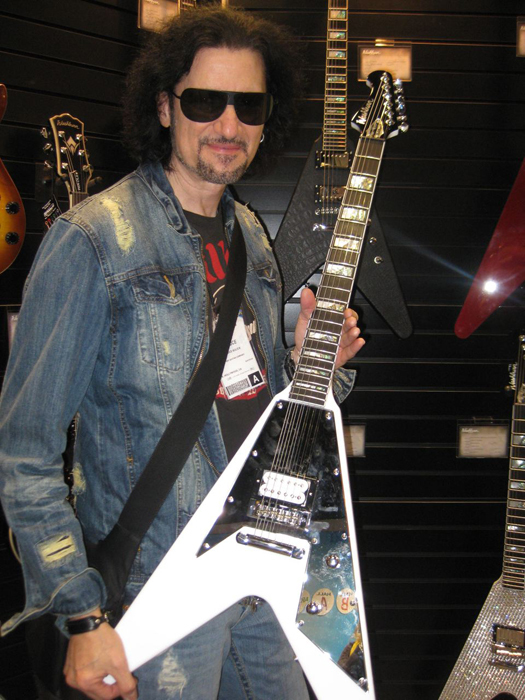 I then headed to Washburn and got some photos of Paul Stanley’s signature Flying V model. I was VERY impressed. 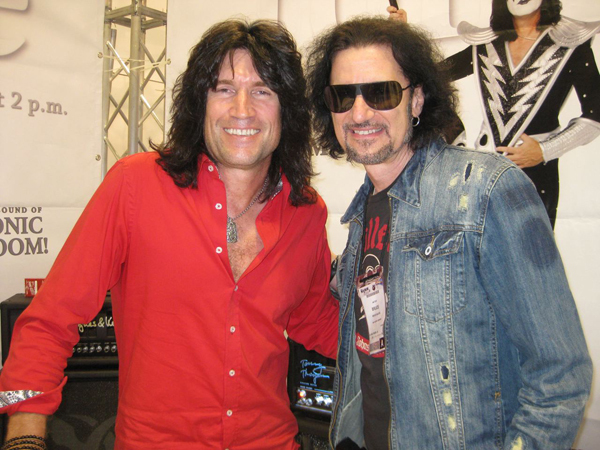 I knew Tommy Thayer was making an appearance at his amp company’s booth, so I headed over there. We took a photo, some fans had me sign some things, and then it was off to my SIT Saturday signing. David Ellefson, who is back in Megadeth, was there and since we have worked together at the Fantasy Camp it was cool to catch up with him. 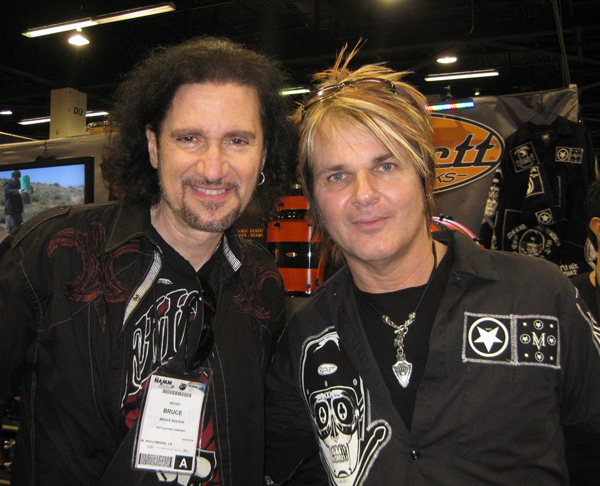 My buddy Fred Coury from Cinderella stopped by as well. 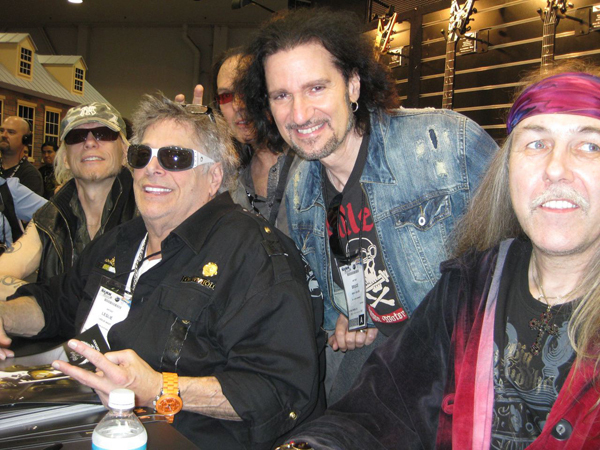 I was thrilled to hear that Leslie West from Mountain was at the show so I headed over to the Dean booth. It was insane, as it was a big signing with the scary good guitarist Michael Schenker, Leslie and Uli Jon Roth were all signing at once. Leslie was so sweet with me. He is a Brooklyn boy and I’ve met him at a Fantasy Camp before. His lovely wife was there, and he kept telling her, ”Get Bruce over here. Lets take a photo!” Leslie is a HUGE influence on my guitar playing; just listen to some of the notes in the ”Hand Of The King” song on BK3 (the one Nick Simmons sings). 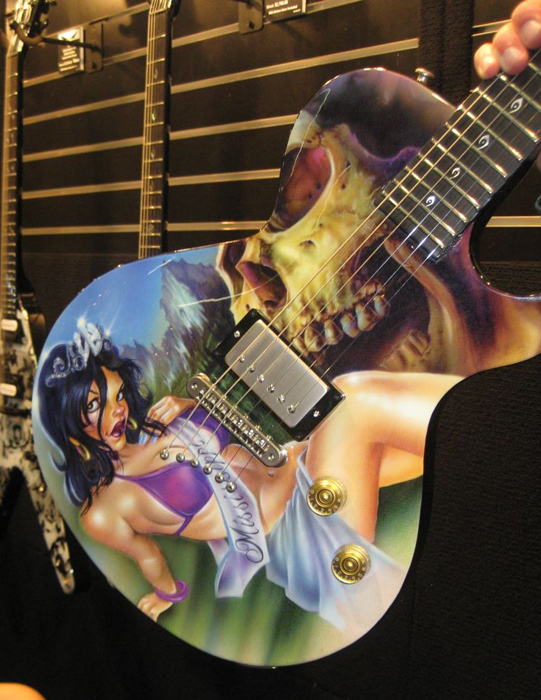 I gave Leslie a copy of BK3, and saw the Mississippi Queen painted Dean guitar that is kind of like his young wife. It was exciting to be there and the crowd was insane. I stopped by Schecter Guitars as there was a big signing there. Robin Zander was in attendance and was looking great in a big mad hatter top hat! 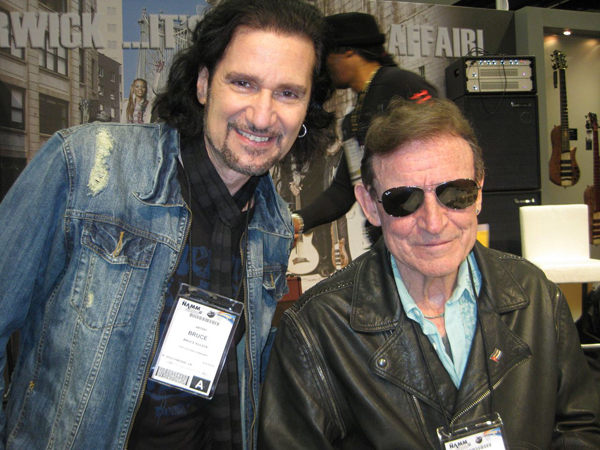 He wanted me to go to the show that night, but I had an early Sunday morning flight for a corporate gig with the Fantasy Camp in Pittsburgh so I had to leave NAMM after the invite only Seymour Duncan party. I invited Jeremy, my BK3 producer, to come along to the Duncan party and that was a very cool hang. I walked over from the convention center with my buddy Dave Amato from REO and Brad Whitford and Derek St Holmes. There were many star endorsers there, and after I thanked Seymour for his excellent work, it was time for home. With the early flight and all, no party for me Saturday night. I think this Message and the photos will certainly tell the story of an amazing weekend. I want to thank all my friends who were there with me, and of course all the companies that have helped me make my music. Many had new exciting products that I will be using this year: from Tech 21 to Egnater to L&M straps, just to name a few companies I didn’t already mention that I endorse and enjoy. You all make my professional career a pleasure to create with those tools of the trade.